RummyPassion.com offers skill based games like online Rummy in a safe, secure, dependable and comfortable environment. 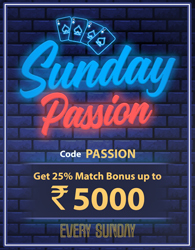 These games are fun to play and participate in and knowing there is trustworthy management behind RummyPassion.com should give you the player, peace of mind. We are completely dedicated to protecting the privacy of our players. Rummypassion.com does not divulge your personal information to a third party without your consent. We use your personal information to better your user experience and to present our players with new offers, products and services. We may share your personal information with prize sponsors and delivery agents through our site. Rummypassion.com employs stringent security measures to avoid loss and misuse of information you provide us. Your personal details are password protected and only you can access your information. Rummypassion.com is not responsible or liable for any activity which is undertaken when your password is used. For this we advise you not to reveal your password to anyone. RummyPassion.com is vehemently dedicated to protecting the privacy of children and does not intentionally collect or use personal details of children under the age of 13. We are in full compliance with the Children's Online Privacy Protection Act ("COPPA"). If someone wrongfully or inadvertently provides personal details of children under the age of 13, RummyPassion.com will securely delete this information from its records and will bar that individual from accessing its products and or services. RummyPassion.com employs certain technology and cookies to collect and store certain information every time you access the website. Cookies make it possible for this website to identify the information you have agreed to provide to this website. This aggregated information assists us in establishing and analyzing the most usable parts of our website. Rummypassion.com may also employ cookies to show you advertising. These advertisements may be displayed by us or for us by a third party. You may change your computer’s settings to disallow your browser to accept cookies. RummyPassion.com employs third parties to advertise on our behalf on our site as well as other websites. These third parties collect details about your browsing habits and your visits to our website including details on your behaviour with our products and or services. They may utilise this collective information about on-site activity and off-site activity to place advertisements. This information is collected with the help of pixel tag technology, the use of which is very common on most prevalent websites on the internet. This collected information remains anonymous. If and when you do not wish to receive e-mail or sms notifications and other marketing details from us, or you wish to remove browsing details that we have collected about you, please you may change your preferences in My Account section.